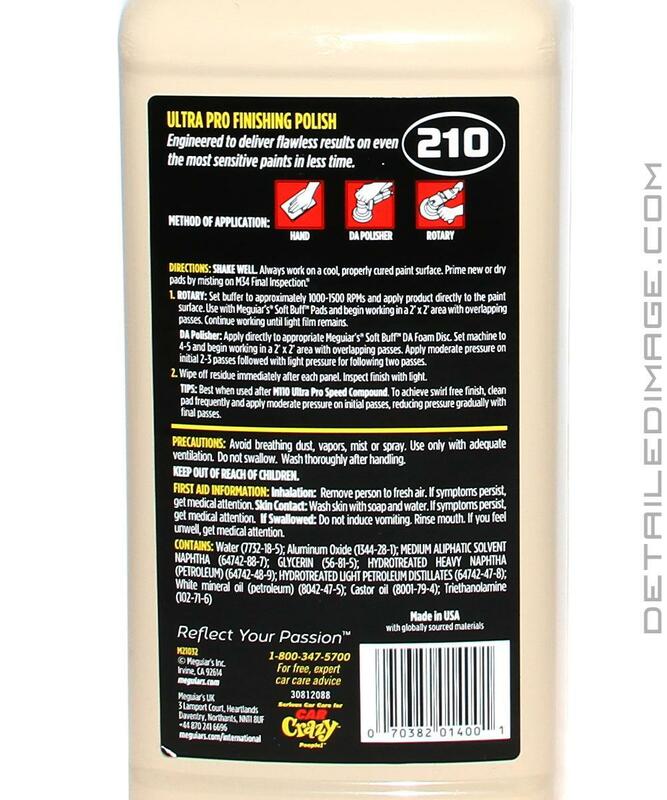 The Meguiar's Ultra Pro Finishing Polish M210 helps to remove light imperfections and refine your paint safely. Whether you only have light imperfections that need to be removed, or if you are following up a heavy correction step, you will need to reach for a light corrective polish. Meguiar's packs this high-quality formula with their SMAT Abrasive technology, which is designed for use with Dual Action (DA) polishers. M210 can be used as a follow up to the equally exceptional Meguiar's Ultra Pro Speed Compound M110, or as a stand-alone one step polish. Light swirls, spiderwebs, and other imperfections will be removed with ease and you will be left with an optically clear, glossy finish. M110 works great on any paint surface but really shines on finicky or soft paint. 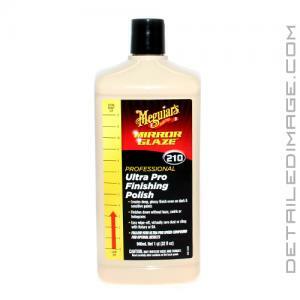 Grab yourself a bottle of the Meguiar's Ultra Pro Finishing Polish M210 and bring your paintwork back to life! Engineered to deliver flawless results on even the most sensitive paints in less time. SHAKE WELL. Always work on a cool, properly cured paint surface. Prime new or dry pads by misting on M34 Final Inspection. Rotary: Set buffer to approximately 1000-1500 RPMS and apply product directly to the paint surface. Use with Meguiar's Soft Buff and begin working in a 2' x 2' area with overlapping passes. COntinue working until light film remains. DA Polisher: Apply directly to appropriate Meguiar's Soft Buff DA Foam Disc. Set machine to 4-5 and begin working in a 2' x 2' area with overlapping passes. Apply moderate pressure on initial 2-3 passes followed with light pressure for following two passes. Wipe off residue immediately after each panel. Inspect finish with light. TIPS: Best when used after M110 Ultra Pro Speed Compound. To achieve swirl free finish, clean pad frequently and apply moderate pressure on initial passes, reducing pressure gradually with final passes. Outstanding product. Only question is....what took Meguiars so long! Very nice finishing polish!! I haven't yet explored the cutting capabilities of this polish compared to the versatile use of M205 (M210 is rated .5 lower on the Meguiar's cut scale vs M205), but the finish with this is fantastic. Very good follow up to M110 or any of your favorite compounds, and the wipe off is UNREAL. So easy you could blow it off.